McAlester Army Ammunition Plant, MCAAP, is located in McAlester, Oklahoma. 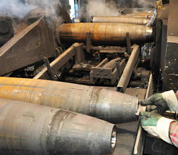 As a weapons manufacturing facility, McAlester's mission is to produce and renovate ammunition and related components. The base also has reserve and training ammunitions storage. Not only does the plant manufacture ammunition, it also handles ammunition demilitarization and disposal. This McAlester Army Ammunition Plant directory features the critical info you’ll need to navigate through the many facilities and recreational opportunities available on base.